Camping Aranypart accepts accommodation bookings exclusively through the online booking system. Via telephone we can only give you information (which is not considered an offer). Within a short period of time after receiving the data by e-mail, the quotation (which is considered as an offer) is sent to the caller, who can accept the offer by reply to the e-mail by placing the booking exclusively in written formor through the online booking system can request the reservation. In order to simplify contact establishment for guests, Camping Aranypart operates a booking system which can be found on the main page of our web site (www.aranypartcamping.hu). We would like to ask our booking guests to fill in the fields in the booking system exactly and correspondingly, particularly when it comes to indicating contact data (telephone number, e-mail and postal address). Guests are responsible for the accuracy of the data indicated in the booking. If a guest cannot be reached via the telephone number or e-mail address indicated in the booking data or the contact data turn out to be incorrect and therefore the booking cannot be confirmed, Camping Aranypart reserves the right to cancel the booking which also erases the claim for accommodation. Please enter your questions into the “Remarks” column. We would like to ask guests arriving with children to indicate the age of the children correctly. In the case of an inquiry, Camping Aranypart sends the guests a written offer which shall not be considered a confirmation. When the offer is accepted in written form, the booking becomes final with the confirmation sent back. These conditions of booking, modification and cancellation also refer to guests whose bookings were made through other platforms offering accommodation at Camping Aranypart (online accommodation portals and travel agencies). 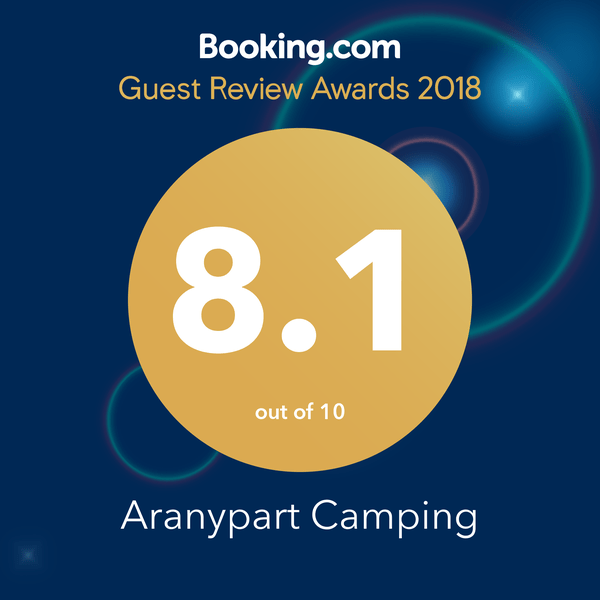 If the information provided by other channels differs from the data on the website of our camping site (www.aranypartcamping.hu), the information contained on our own website shall prevail. Camping Aranypart does not take responsibility for such differences and the possible damage incurred. Parties shall always attempt to settle their disputes arising from the accommodation contract in an amicable way. . If the matter cannot be settled amicably, the parties will take legal action in order to settle their dispute. For the settlements of their disputes arising from this contract, dependent on the competence, parties accept the exclusive jurisdiction of District Court of Siófok and the Regional Court of Kaposvár. In the case of booking demands related to a particular holiday house, mobile home or plot number, we can reserve the desired accommodation for an additional charge of 15000 HUF, if it is available. However, if we are unable to provide the booked place due to technical or other reasons, we will reimburse the extra charges. These deposit payment conditions refer exclusively to individual bookings (simultaneous booking of at most 5 “units”). The simultaneous booking of at least 6 “units” is considered a group booking where special deposit conditions shall apply. For all individual bookings, Camping Aranypart requires a deposit of 50 %. The remaining amount of the accommodation fees, the possible additional costs (e.g. extra charge for a lakeside plot, fees for extra persons and so on) and the tourist tax shall be paid upon arrival at the reception of the camping site. The modification of your booking prior to your arrival is only possible after a written consultation with the camping operator. The change of the arrival and departure dates are considered a modification of the booking.. The house rules of the camping site contain important rules you are obliged to comply with. We would like to call your attentive to the fact that during the peak season the entrance/gate of our camping site is closed from 11.00 pm to 06.00 am in order to guarantee a good night’s rest at the camping area. The closing period relates to all opening times of the camping site. In the indicated period arrivals and departures as well as the entire vehicle traffic shall be stopped.